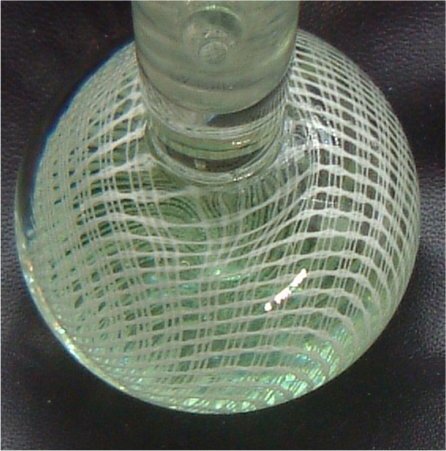 HARRTIL This vase is 237mm tall (approx 9 & 1/2 inches) and has a pale green core overlaid with a white lattice or criss cross pattern looking similar to Merletto (Italian), this technique is acheived using asbestos netting. The whole has then been encased in clear glass. 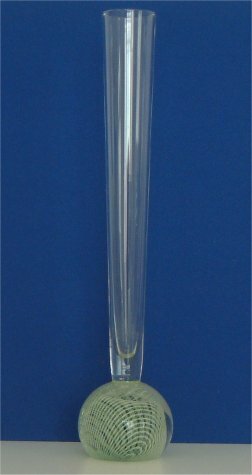 The stem is clear and has a medium flare, being 29mm wide (approximately 1 & 1/8th inches). The bottom of the base is smooth and has a slight depression (see below). 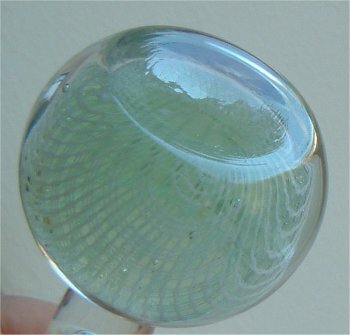 This technique was designed by Milan Metelák at the Harrach'ov factory in Czechoslovakia in the 1950's. This range was called called Harrtil.